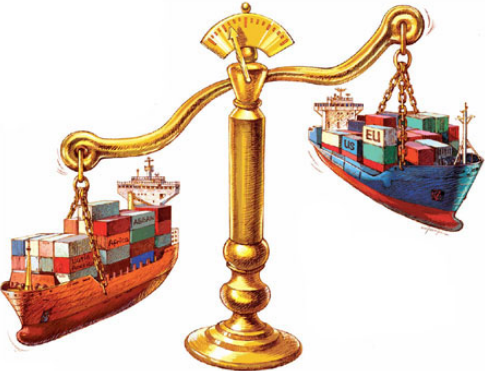 Trade balance refers to the difference between country's export and import. It synonymously used with balance of trade (BoT). Imports, foreign aid, domestic spending abroad and domestic investments abroad are the debit items and exports, foreign spending in the domestic economy and foreign investments in the domestic economy are the credit items. A country is in trade surplus when it exports more than it imports, and on the other side a country is in trade deficit if it imports more than it exports. In forex trading both trade deficit and trade surplus can be considered as either positive or negative for a currency, depending on the economic health. A misunderstanding is found among the traders that only a trade surplus is positive for a currency and economy. In a recession period, trade surplus is good because it increases exports, creates jobs and demands, but in an expansion period, trade deficit can also be considered as positive because it facilitates competition, controls inflation through controlling the price of goods and services. So, whether a trade balance is positive or negative for a currency greatly depends on the economic cycle as mentioned above. Higher interest rate can be a vital factor that significantly affects the trade balance. this is because, higher interest rate can pull the foreign investment into the economy. Dear Traders, If you have any suggestions, questions, or complements, you can drop a comment below.